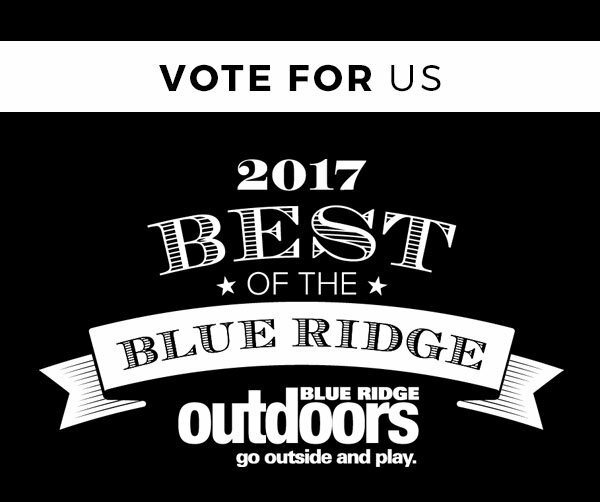 Join us in voting for some of NOC's best guides and athletes in the "Best of the Blue Ridge Awards." Or if you've ever had a blast zip lining, rafting, shopping or attending events with NOC, consider voting for us in the following categories: Raft Guide Company, Outdoor Shop, Festival, Kid-Friendly Outdoor Destination, Paddling Event and Zip Line. Be sure to also vote for your favorite paddling river and SUP spot! You can cast your votes once a day until October 31st! Click here to find the polls. Below you can read about NOC's nominees. Under "Local/Reginal Athlete" we have 2 NOC nominees: Michal Smolen & Ty Caldwell. NOC Athlete Michal Smolen is NOC’s 23rd Olympian. After years of training on the Nantahala River and coaching with the Nantahala Race Club, Michal qualified for the Semi Finals in K1 Slalom at the 2016 Olympic Games in Rio. His other achievements include World Cup Bronze, Pan American Games Gold, two-time National Champion and U23 World Champion. Learn more about Michal at michalsmolen.com. Ty Caldwell is a true home-town hero of Western North Carolina, born and raised in Robbinsville, NC. While Ty works full-time for Astral Designs, he is also a NOC Master Guide who works with the NOC Instruction Department and is a Kayak Guide on his home river, the Cheoah. Ty is famous for his dry wit and his fancy acrobatic down-river play moves, often placing in the top of the Green River Games. He’s no slouch on a mountain bike either! Under "Raft Guide" we have 3 NOC nominees: Jonny Horton, Joe Dean & Kaitlyn Stell. NOC Master Guide Jonny Horton lives on the banks of the French Broad River and guides on 7 of the Southeast’s classic rivers, including the Cheoah. Jonny teaches NOC’s Guide School and Swiftwater Rescue courses and is one of NOC’s most sought-after guides. Beyond the river, his hobbies range from carpentry and building to hiking—Jonny does it all. Joe Dean has been guiding for NOC for over 12 yrs. This Vietnam Vet was once a Train Conductor and now affectionately goes by the nickname “River Squid”. Joe’s pattened move is a well-timed spin above Nantahala Falls, great photos everytime! Kaitlyn Stell is early in her guiding career, but she is no less of an asset to the adventure community. Kaitlyn started on the Chattahoochee River helping to facilitate getting the youth of Atlanta connected with the river through NOC’s operations in the Chattahoochee National Recreation Area. Now at NOC’s main campus on the Nantahala Kaitlyn can be found guiding on the river, in the air and even helping guests plan their adventure through the reservations office. Under Outdoor Legend/Pioneer NOC's Chattooga Outpost Manager Dave Perrin was nominated. Operating on 8 rivers across the Southeast, Nantahala Outdoor Center trains and employs more river guides than any other outfitter. Training starts with a 5-day Raft Guide School which sets the building blocks in place for guides to become seasoned river professionals. NOC also trains an elite group of 12-20 Master Guides annually to become River Rescue Pros, Wilderness First Responders and provides extensive development opportunities to ensure that these outstanding individuals continue to be leaders in adventure. NOC strives to be an ideal outdoor recreation setting which facilitates a work hard/play hard lifestyle for its employees. This attention to top-level training sets the stage for the Southeast’s premier adventure hub, which includes guided rafting on 8 rivers, 3 retail stores, 3 restaurants, the industry’s best paddling school, zip line adventures and much more. NOC’s annual Guest Appreciation Festival is the Southeast’s most venerable gear festival and outdoor lifestyle celebration. The riverside festival is traditionally anchored by NOC’s Used Gear Sale, where NOC’s large rafting, kayaking and rentals businesses sell off the season’s equipment—providing the best prices of the year on specialty outdoor equipment like boats and bikes. Over the years GAF has grown to include deep sales on new gear in the Outfitter’s Store, a used­-gear marketplace where guests can buy gear from other guests, free shuttles for beginner to advanced ­level paddling on the Nantahala, Upper Nantahala and Nantahala Cascades, open competitions and races, free live music, entertainment and kids' events.